A $5,000 AT&T contribution to support the high school construction project in Sturgeon Bay was presented to the Door County Economic Development Corporation Monday morning. The funding will support the program launched in 2007 as part of an ongoing commitment to provide real-world experiences for students and enhance the county’s skilled workforce. 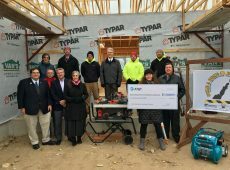 The event at the site on North Columbia Avenue recognized the project and program which provides the construction of a home built by students from the ground up, under the direct guidance of Seth Wilson, Tech-ed Instructor at Sturgeon Bay High School, and trade professionals. The home construction project, which began in September, is expected to be completed in late May 2109. Some of the dignitaries on hand for the check presentation included in-coming State Senator Andre Jacque, State Representative Joel Kitchens Sturgeon Bay Mayor Thad Birmingham, Jim Schuessler, Executive Director of the Door County Economic Development Corporation, and Robert Nickel, Sturgeon Bay High School Principal.